Wow, SEGA really hates trashing music, doesn't it? Also... if the red hedgehog is called Ketchup, and the yellow one is Mustard.... whay about calling the new, white one Mayo? This is great. The game is full of surprises! Great to see this has seen the light of day, drama regarding the fallout can be dealt with later. 8B was quite the surprise too! 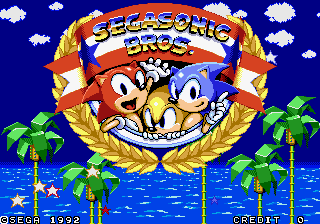 Another hint that SegaSonic Bros. was developed for MD first: A good number of the color palettes are already in the right format! This works because the Genesis palette format (xxxxBBBxGGGxRRRx) is a subset of the System C format (xBGRBBBBGGGGRRRR). Also, it's kinda working already. Once again, massive things happen when I disappear for a couple of days. yoooo the special stage theme!! There are some differences. 8b's backing percussion has a different structure (intense emphasis on beats 2 and 4, which makes it feel plodding...), its snare is very loud, and its hi-hats are much quieter. 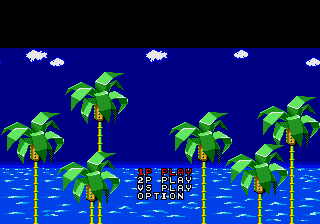 The bridge before the track loops feels much sloppier than the Sonic 3 version in a way I can't place, though it might be the percussion's fault there. The waveforms are really, really different despite sounding similar enough that you can (mostly) layer the two versions together without it being an unholy mess, though how much of that is due to the Sonic 3 rip I don't know. 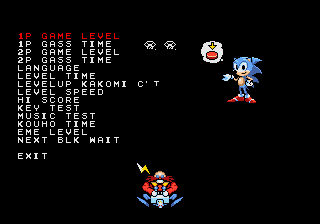 All in all, I don't think the Sonic 3 version is a simple "copy-paste", it got polished up a bit before being reused. The mad lad! This is awesome. The percussion's the exact same (bar everything being FM). The only differences in the song are some smpsModSet commands being shuffled around in the FM melody tracks. Anyway, the reason the song doesn't work properly in Sonic 1 is because S1's driver moved the smpsReturn command from $F2 to something else, while this game's driver kept it in the normal slot. ...Who is this Dustin guy anyway? I've never heard of him before. Dustin O'Dell uploads high quality Genesis music to his Youtube channel. I've been subscribed to him for a while now, it's interesting to see that he's taking the time to port the game to the Genesis! I've mentioned Retro to him in the past, he's done quite a bit to rip Jurassic Park: Rampage Edtion's music. Everything surrounding the discovery of this game and unearthing its contents has been amazing. Hats off to all involved! 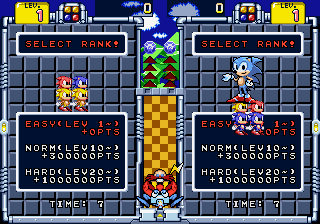 To think that all this time, the Special Stage music for Sonic 3 & Knuckles actually originated somewhere else prior! It reminds me a bit of the Hard Times song discovery for IceCap Zone's music. A magical fairy dropped this off. There's a nice surprise in there. As I was listening through the soundtrack you provided, track 85 caught my attention almost immediately, in that (to me, at least) it has more than a passing resemblance to an unused music track from Sonic Jam. I've put together a quick-ish audio comparison video, starting off with a rough mashup, followed by comparing segments of each track side by side. 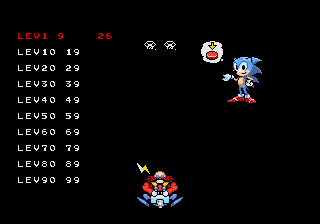 I also slowed down the SegaSonic Bros. track to match the speed of the Sonic Jam track. To be fair, there are some points where they don't match up well (The mashup portion clashes pitch-wise. ), and both tracks have significant differences to be sure, yet at the same time, they feel quite similar to me. Selecting options gives you another version of the test menu, which is more of a debugging menu at this point. The only one I can't identify is loc_3A26. This gets called when you select 1P Mode, but changing to it crashes the game. Curses, you beat me to the good stuff. Nice finds though! I'll see if I can 'fix' some if it when I get back. 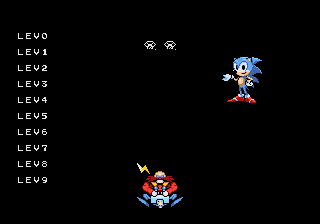 Ok so we probably all noticed backgrounds from or similar to Sonic 1 being used in the game, Makes one wonder if perhaps some of the graphics in this game were early prototype graphics from sonic 1. maybe some we had never seen before. 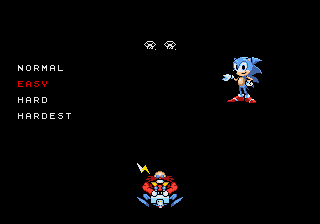 Well, Robotnik juggles a set of all-blue Chaos Emeralds like those in GG Sonic 1, so there's that. Oh, cool! Earlier in the thread, I noted how track 85 had similarities to the Sonic Jam credits song. I'd completely forgotten about the unused song, and now I'm even more convinced. The unused Jam song is sort of a connective tissue between the two. Sonic Jam's composers were Masaru Setsumaru and Kenichi Tokoi. According to the wiki, it was Setsumaru who composed the staff roll song (not sure where the info of who composed each song came from). The wiki also says that he was the composer for Sonic Eraser. So that's certainly something. Yeah, that seems too specific to be a coincidence. We know that 8-bit Sonic 1 had some scrapped elements from the 16-bit version, like Sonic singing, and the basic idea of the final boss (and unused turrets).